Earlier this year the guy’s at Pro Adventure in Llangollen invited me to join them on the first of their new range of Wilderness 5 day expedition courses up in Scotland. As part of my eco-friendly family holiday search this trip sounded perfect and with trains running straight into Glenfinnan, the location was perfect too. The expedition was to take us the entire length of Loch Shiel (better known these days as Hogwarts Lake in the Harry Potter films) and all the way down to the sea at Moidart. It was early April and bitterly cold and here I was in the Scottish highlands about to go camping again! Is that dedication or what? I have to admit to being slightly nervous about going on holiday with a group of people I’d never met before and I really didn’t know what to expect. I was about to say ‘not knowing if there was a mad axe man in our midst’ but there were plenty of men and a few axes so that probability seemed quite high! In reality though, everybody seemed lovely and in no time at all we were wheeling our boats down from the Glenfinnan Hotel car park to the waters edge. Scotty our canoe guru for the 5 days, soon had us on the water to see what skill levels we were all at. There was Helen, a Vicars wife from the West Midlands who had been kayaking before but canoeing on open water was something completely new to her. There was Joel her 14 year her old son. Me, who virtually lives in a canoe but has the laziest style of paddling possible and finally there was Richard, an Ecologist who had never set foot in a boat before. Even at this level Scotty soon had us prepped up in no time and it wasn’t long before we said goodbye to the shore and headed off on our adventure. As this was day one, we took it easy and our first stop for lunch was only 45 minutes later, less than 2 miles down the Loch. There was a nice pebbly beach, some rocks and bushes and a lovely little island about 50 meters away. From here you would normally be able to see for miles down the loch but all we could see was the weather closing in on us. With this on our minds we didn’t stop long and sure enough within minutes of being back on the water, the snow began to fall. I adore snow flurries so I was in my element paddling through this magical winter scene. As the snow got heavier it formed a thick blanket around us but it was fine as we could still make out each others brightly coloured Buoyancy aids shining through. Then suddenly the wind picked up and we were paddling in serious blizzard conditions. Waves were splashing over the gunnels as the winds swirled around us. I looked over to Helen knowing how she’d feel, her first time in open water with her young son in the boat and being faced with conditions like this. She was amazing though, she kept her calm and held the boat firm until the worst of the winds had abated and then followed us into a sheltered bay to safety. I would have been terrified if that had happened to me on my first outing. Anyway, after a quick assessment of the conditions it was decided that it was time to find our first nights camp. I’d read about a lovely camping spot about 6 ½ miles from the start, which if we paddled hard enough, would only be an hour away. According to the map there was a river running alongside which when we arrived, made it really easy to find. It was a lovely sheltered spot surrounded by woodland (firewood) and a sandy beach which made landing simple. The snow was still falling heavily which made the tarp building and fire lighting a bit of a challenge, but eventually Tom our bushcraft instructor for the week managed to sort it all out and we all had a relaxing albeit an eye watering evening (from the smoke) around the fire. The following morning we were all up fairly early and were treated to a tandem paddle stroke session from Scotty. The sun was shining and spirits where high as we packed up camp and headed off to what has to be one of the most picturesque campsites ever. It was just under 5 miles further down the loch and we came across it by accident really. We’d stopped for lunch on a little pebble beach and were having a demonstration by Tom on how to filter water using moss and sand when Scotty appeared from over a hill saying he had found an amazing site. Ok so it was only lunch time and we’d only paddled 4.7 miles but this spot was just too good to leave. It was on a little headland (featured in the Highlander movie), surrounded by trees and even had perfect little spots already laid out to erect our tents, tipi’s and tarps. Helen and I soon commandeered a small hump to be the ladies bathroom, which had stunning views and the guy’s were left to trek over to an old fallen down pine tree on the other side. We had such fun that day setting up camp and learning loads of new bushcraft skills. I think the idea was to acquire sufficient skills during the day so that we could all build shelters that evening and sleep out in them. This didn’t go quite according to plan though as we kept getting side tracked and the urge to make fire without the use of matches soon took over as the main objective of the day. By early evening we decided to head out in our boats again and paddled over to the island of Eileen Fhionain. On this sacred isle lays the ruins of St Finan’s church surrounded by some magnificent Celtic Crosses. The views from here alone were well worth the 2.2 mile return paddle. When we arrived back at the camp Pete, who owns ProAdventure had a big roaring fire waiting for us and lots of hot water on the boil for tea. We all set about making our own dinners whilst sat around the fire and watched in awe as the sun set over the loch. It was absolutely fantastic. Well apart from poor young Joel who was sampling his first ever Wayfarer meal. Soon after the words sickly gooe and child abuse were whispered, which made us all laugh. Later that evening Tom taught us how to make Birch Bark Torches. With only a stick a sharp knife and some carefully folded bark these torches were great and lasted so much longer than I’d ever of imagined. This was followed by some toasting of marshmallows, a few glasses of good wine and a really nice chilled out evening was had by all. Day three and we woke up to quite a grey day with strong north westerly winds. Today was a canoe skills day and no sooner where we on the water than we were learning all about trim, wind and ferry gliding. We were heading straight across the loch to paddle up the River Polloch. Here we were taught the art of Poling then later had a nice picnic under a tarp followed by an afternoon of Tracking and Lining. I can’t say I’m much of a fan of this and for me its something once learnt you only ever do again when you need it. However, everyone else had a great time and amazingly no one fell in. Back at camp and it was straight into bushcraft skills again which I love. 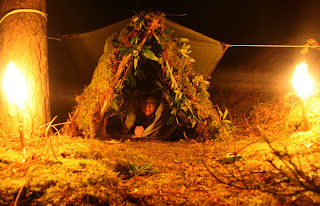 Joel started to build his own shelter out of branches, moss and rhododendron leaves and within a couple of hours he had a structure that Ray Mears would be proud of. I was quite jealous as I would have loved to have slept out in one myself but I’d been too busy enjoying making pot hangers with Richard that I ran out of time for shelter building. It was another great night around the fire and Joel who slept soundly all night, declared his shelter was warmer and comfier than the tent he’d used the previous evening. The following morning I was woken up by a text from a friend warning me of a huge storm and gale force winds which was forecast to hit Loch Shiel that evening. It all felt quite dramatic as Pete phoned his office to see if he could find out some more details. And true enough a storm was coming and the effects were set to last a few days. It was a tough decision especially for Pete who had everyone’s safety to consider and also the logistics of how to get us all back to Glenfinnan the following day. So disappointingly but very sensibly it was decided to make the most of the days good weather and paddle the 6.4 miles to the bridge at Acharacle (which had access to the A861 main road). Pete set off early in the opposite direction towards Glenfinnan to pick up the minibus and planned to meet us at the bridge at the end of the day. We were going to be cutting the trip short by 24hours which meant we wouldn’t reach Moidart or get to paddle with the seals but safety had to come first and we were all happy with the decision. So with the sun still shining and not a breeze in the air we made our way towards the end of the loch. 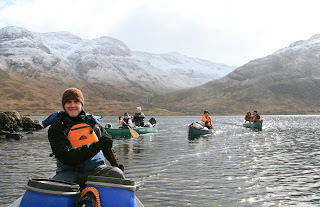 The scenery was stunning as we paddled between the huge snow covered mountains towering above us. We even saw a Golden Eagle which certainly made my day. The conditions were so perfect that we reached Acharacle in just a couple of hours so after 4 days of camp food we decided to treat ourselves and walk into the village to find the chippy we’d heard about. It’s a good 30 minute walk, which was quite uncomfortable in my pink paddling wellies but on tasting those chips, they was worth every one of the blisters. A couple of hours later, Pete arrived with the mini bus and this excellent wilderness trip was over. Pete offered everyone a free day’s activity and tuition back in Llangollen to make up for cutting the week short but everyone had had so much fun they were already booking their next courses. Excellent hotel that is happy to let paddlers leave their cars in the car park as long as they have no big functions on. All they ask is for you to fill in a special form at reception before you set off.